It has been a few months since Amazon released the Fire Phone smartphone on AT&T Wireless. From many indications, the launch of the Amazon fire has not been a smashing success. For example, see this Time article “4 Reasons Amazon’s Fire Phone Was a Flop,” which claims Amazon is stuck with $83 million of unsold phone inventory. Time says the phone was too expensive, has a small app store, was late to market (too many iPhones and Android already, apparently), and the new features are not that appealing. Of course, Time is just saying what everyone else thinks and takes for granted. Amazon was forced to reveal that it took a $170 Million writedown on the device. So, obviously business has not been swift. 1. Price: While the Fire Phone was launched with a $199 price tag with a 2-year AT&T Agreement, I am now seeing the phone as available for free for new customers. A free fire phone holds much more appeal to me, especially with the number of “free” smartphones on the market. I have been a Prime member for several years. The fast free shipping upgrades have been a godsend at holidays and the start of the college semesters. If you already have a Prime membership, Amazon says they will extend yours for 1 year. If Prime is something you take advantage of, the integration could make this an exceptional feature. 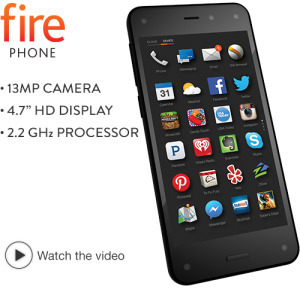 You could do much worse than a free fire phone from Amazon.